You never get a second chance at a first impression, that's why it's important to make certain that the first impression is a favorable one. This home selling guide will offer you simple advice to help you sell your home quickly and for top dollar. Write out your plan and your goals for each room in the house. This will help you track your progress, set a schedule that you can work with and reach your goal for each room. Grab a pen and paper and take a walk through your home room by room. Imagine you are seeing it for the first time. What do you notice first? Clutter in a corner? A paint color that is not generally appealing? It is really important for you to separate yourself from the house at this point. You now need to view your home as a product. What is not working in the space? What doesn't look right? What is the focal point of the room and is it being emphasized or hidden? What is the purpose of the room? Is it easily defined or is it a catch all room like office / gym / guest room? It is best to show the room with only one function. Clutter: Are all flat surfaces covered with stuff? Do you have room to move around the furniture without bumping in to anything? Does the room feel crowded or airy? Crowded closets: What is the condition of your closets? Are they disorganized? Overcrowded? Do they need to be put on your to do list? Closets look best half full, not bursting! Is there ample lighting in the room? Natural light? Throw open the curtains and let the light in. See how it changes the feel of the room. Take note of the conditions of the walls. Do they need paint or repair? Is the color outdated, bright or in any way overwhelming? Is the flooring in need of repair, replacing or deep cleaning? Home staging has been proven to help sell a home faster in any market. Now that you have taken an objective look at your home, lay out your plan task by task in a way that you will find easy to follow. The following phases outlines sensible order for projects. This is a time consuming, but essential part of the staging process, especially if you have lived in the home for many years or have a large accumulation of "stuff". If you do not adequately clear the clutter, you will be able to finish staging with ease. Removing clutter requires more than just clearing surfaces of excess nick-knacks, boo ks and papers. Clutter is anything that contributes to a chaotic, busy feeling in a room, and that can include excess furniture, wall art, area rugs, kitchen gadgets and paper work. Now is the time to take your favorite collections and pack them up, along with all of your personal photographs (yes, all of them). Remove all hobby related clutter. Why? When a buyer walks into your home, you want them to see themselves there - not you and your family. You don't want the possible buyer to wonder about the people who live in the house. You want them to picture themselves in the space. 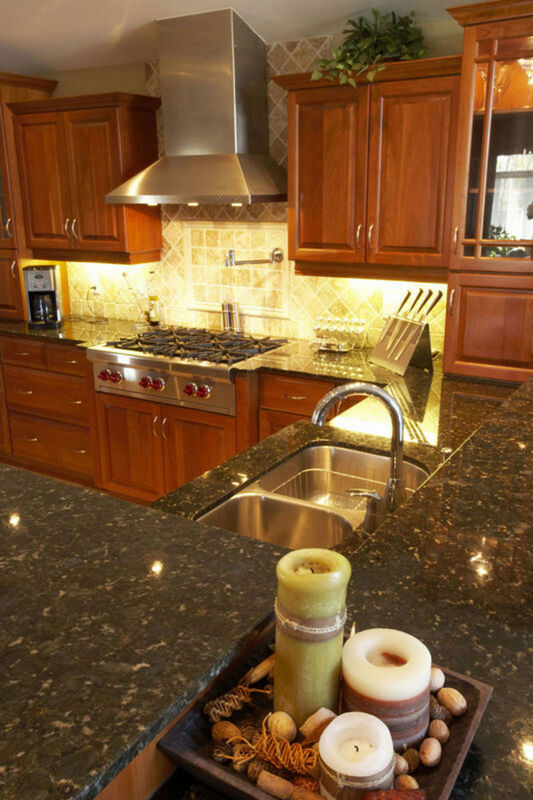 Clear all counter tops of gadgets, cookbooks and appliances that aren't used daily. It is acceptable to leave out your coffee maker and toaster, but store the food processor, mixer, blender, cooking tools and books somewhere out of sight. It is best to pack as much as you can at this point. It will save you time later. A spotless, updated kitchen is an easy sell! If you have children, then you know that keeping their rooms organized can be a full time job. Have them help. Pack up as many toys as they can do without. Assure them that they will have them all again soon in their new home. Organize the space. Utilize the space under the bed for storage of remaining toys. Sort through clothing and store or give away any items that are no longer needed. A clean usable garage and a clear basement, whether finished or unfinished is a bonus for buyers. It gives them more possibilities when considering the functionality of your home, for them. Summary of personal items to pack: personal photos, albums, jewelry, toiletries (the bare essentials can be stowed under the sink -but not out in the open for all to see), hobby related items, and anything that could be offensive to the buyer. Anything that tells too much about you! Musical instruments (unless there is an extra room dedicated to music, but few buyers will be interested in having their own music room). Do not leave out expensive collectibles to try to impress buyers. If that is not possible due to budget constraints, the attic is preferable to the basement. If you do choose to use the basement for storage, do so as neatly and compactly as possible. You want to leave as much open space in your home as possible. All of the clutter is cleared out and some of the extra furniture has been removed. Now you may notice that some walls could use fresh paint and the floors may need repairs. Now is the time to do it. There as some small improvement that you can do yourself at this point that will yield large returns, according to a HomeGain Survey. Clean every inch of your home meticulously, or pay someone to do it for you. A home that is sparkling clean gives the impression of a well-cared for home all around. If your home is less than immaculate, it could give the impression that you let things go and that could include home repair and maintenance. It may make a buyer suspicious of the property. Pay extra attention to the kitchen. Clean and organize cabinets. Clean all windows inside and out, to allow sunlight to flow through the house. Consider having the exterior power washed if necessary. Repairing minor problems can make a big difference in the sale price of your home, as can small improvements. Be sure to repair any cracks in walls, scratches in the floors or hire a handy man to take care of these repairs. It is your choice whether or not to paint, and you may be thinking why spend the money on a place that I am leaving? Studies show that painting your home (making it move in ready) increases the sales price and may expedite the sale. Choosing paint colours is an immensely important task when you are preparing your home to sell. Take into account your target audience and go from there. Consider the function of each room. Children's rooms can still have color, but subtle versions (white with a hint of color) like pink, blue or yellow are best. Neutrals are the rule when home staging, but that doesn't mean white in every room. How will the lighting work with this colour? Will this colour look right with the existing window treatments? Are trying to warm up or cool down the room? Are you trying to make it look light and airy or warm and cozy? Choosing the same colour for several rooms will save you time and money. There will be less excess, and the painter (even if it is you) will not have to stop to clean brushes and rollers as often. Depending on lighting, the same colour may look different from room to room. This will also take the guess work away from figuring out if these colors work together and give the home a unified look. When choosing colours for the basement, and even the garage, you want to consider warming up these otherwise cold spaces. Warmer neutral colours work well. You can also paint unfinished concrete floors for cleaner look. This step is key, and for many people the most difficult. If you don't have an eye for what really works in a room, by all means, call in a professional. In the picture to the right we have an illustration of a conversation area with a clear , uncluttered space and a defined focal point. Bring your furniture close enough together to create a comfortable conversation area, giving everyone access to the table. This give s a feeling of warmth. Hang pictures / art work at eye level. If you are using it as the focal point in the room, be sure it is the appropriate size for the space. In the bedrooms, the bed /headboard often works as the focal point. Place the bed in the room leaving space to walk around three sides. Accessorize in groups of three. This is an appealing way to display accessories on a table or dresser. Keep all areas well lit. Add lamps if necessary. Open window treatments allowing an abundance of natural light in the home. Help buyers feel welcome by creating an easy flow from room to room. Place the largest piece of furniture first, and work around that piece. Balance furniture in the room. For example, a sofa can be balanced by an armchair on either side. Don't be afraid to float the furniture away from walls. If you have the space to do it, it will accentuate the available square footage. Keep bookshelves well organized. Organize the books by size. Remove any excess. Keep 1/4 of shelves clear to avoid a cluttered look. Go outside and take a look around using that critical eye you developed in the beginning of your home staging process. How well kept is your yard? Is there shrubbery blocking the windows? Are all walkways clean and tidy? Is the driveway clean? Are there toys strewn around the yard? Remove any outdoor clutter including empty flower pots, gardening tools, toys and bikes. Keep all shrubbery and lawns neat and trimmed. Remember to remove any extra vehicles from your driveway on open house day! Consider painting the front door and trim on the house for a quick and inexpensive update. Make any necessary repairs to the driveway and walkways. Keep your front door clean and clutter free when staging your home for sale. Selling a vacant property can be difficult. Only 10% of buyers have the ability to visualize the potential of a home. Staging a vacant property the same way a builder stages a model home is essential, especially if you need to sell quickly. If you are working with a tight budget you could focus on staging the three most important rooms: living room, master bedroom and dining area or eat in kitchen. Lighten and brighten: Make sure the home is well lit and the window treatment are open when buyers are viewing the home. Paint and repair flooring: This step cannot be missed! if any rooms are left vacant, the walls and floors are all the potential buyer will see. Be sure they are perfect. You may want to consider a home staging company: Rent furniture and accessories from a rental company. Look for a company that provides a short term contract. Most buyers want a squeaky clean home full of sunshine that is move in ready. Only a small percentage of buyers (15%) have the financial ability for major repairs and the visualization of the homes potential. It is your job to show off the best qualities of your property, while toning down any flaws. In a strong market, staging your home helps it stand out from the others and sell fast. In a slow market your home needs to really shine for every potential buyer that walks through the door. Or optional check list format, guide to Preparing your House to Sell Guide, Required Steps for a Successful Sale. Your hard works has paid off and now your home is ready to be sold. Your next steps are to effectively price, maximize marketing and the sale price of your home. Ask a full time Top Producer Real Estate Professional, contact me and I will provide you with a FREE NO OBILIGATIONS HOME EVALUATION. I will provide you the correct and honest answers to your questions, and advise you what needs to be done to get it Sold!!! For Top Dollar in the Shortest Time.